Ernst August III von Hannover (born Ernst August Christian George on November, 17 1887 in Penzing, Austria-Hungary), is the current ruler of Duchy of Braunschweig, one of the constituent states of the German Empire, after his restoration on November, 1 1913. He is mostly known for his wedding with Princess Viktoria Luise, the only daughter of the Kaiser Wilhelm II. Ernest's great-grandfather, Prince Ernest Augustus, Duke of Cumberland, the fifth son of George III of the United Kingdom, became king of Hanover in 1837 because Salic Law barred Queen Victoria from reigning in Germany. However, in 1866, during the Austro-Prussian War, the kingdom of Hanover was annexed by Prussia, due to its alliance with Austria, and King Georg V of Hanover came into exile. His Royal Highness Prince Ernst August of Hanover, Prince of Great Britain and Ireland, styled "Prince Ernest of Cumberland", was born at Penzing near Vienna, the sixth and youngest child of Crown Prince Ernst August of Hanover and his wife, the former Princess Thyra of Denmark. His father succeeded as pretender to the Hanoverian throne and as Duke of Cumberland and Teviotdale in the peerage of Great Britain in 1878. The younger Prince Ernst August became heir apparent to the dukedom of Cumberland and to the Hanoverian claim upon the deaths of his two elder brothers, Georg and Christian. In 1884, the reigning Duke of Braunschweig-Wolfenbüttel, a distant cousin, died and the Duke of Cumberland claimed to succeed to that territory. However, the Imperial Chancellor, Otto von Bismarck, managed to get the Bundesrat to exclude the duke from the succession. Bismarck did this because the duke had never formally renounced his claims to the kingdom of Hanover. Instead, Prince Albrecht of Prussia became the regent of Braunschweig. After Prince Albrecht's death in 1906, the duke offered that he and his elder son, Prince Georg, would renounce their claims to the Duchy in order to allow Ernst, his only other surviving son, to take possession of the Duchy, but this option was rejected by the Bundesrat and the regency continued, this time under Duke Johann Albrecht of Mecklenburg-Schwerin, who had previously acted as regent for his nephew in Mecklenburg. When Ernest's older brother, Prince Georg, died in an automobile accident on May, 20 1912, the Kaiser Wilhelm II sent a message of condolence to the Duke of Cumberland. In response to this friendly gesture, the Duke sent his only surviving son, Ernst, to Berlin to thank the Emperor for his message. In Berlin, Ernst met and fell in love with the Kaiser's only daughter, Princess Viktoria Luise of Prussia. On 24 May 1913, Ernst and Viktoria Luise, third cousins once removed, were married. This marriage ended the decades-long rift between the Houses of Hohenzollern and Hanover. The wedding of Prince Ernst August and Princess Victoria Louise was also the last great gathering of European sovereigns before the outbreak of the Weltkrieg. In addition to the German Emperor and Empress and the Duke and Duchess of Cumberland, George V and Queen Mary of the United Kingdom and Tsar Nikolai II attended. 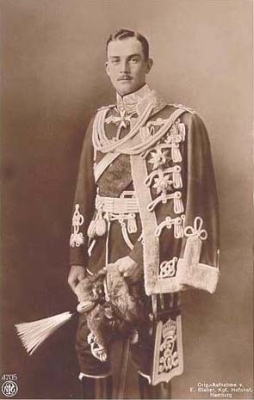 Upon the announcement of his betrothal to Princess Viktoria Luise in February 1913, Prince Ernst August took an oath of loyalty to the Kaiser and accepted a commission as a cavalry captain and company commander in the Zieten–Hussars, a Prussian Army regiment in which his ancestors Georg V) and Ernst August I had been colonels. On 27 October 1913, the Duke of Cumberland formally renounced his claims to the duchy of Braunschweig in favor of his surviving son. The following day, the Bundesrat voted to allow Prince Ernst August of Cumberland to become the reigning Duke of Braunschweig. The new Duke of Braunschweig, who received a promotion to colonel in the Zieten–Hussars, formally took possession of his duchy on 1 November. During the Weltkrieg, the duke rose to the rank of major-general. On 8 November 1918, he was forced to abdicate his throne along with the other German kings, grand dukes, dukes, and princes. The previous year, the Titles Deprivation Act suspended his father's Dukedom as a result of the Duke's service in the German army during the war, so that when his father died in 1923, Ernest Augustus did not succeed to his father's title of Duke of Cumberland. This page was last modified on 25 July 2010, at 17:44.